Uncover the memories of the Dwemer. Accept the Lexicon from From-Deepest-Fathoms. Return the Lexicon to Avanchnzel. 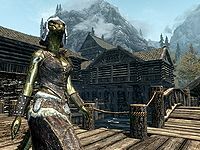 Once you reach level 14, a female Argonian named From-Deepest-Fathoms will appear near Riften Fishery, walking around in circles, manically talking to herself. When you approach her, she will tell you about a place called Avanchnzel and an item she refers to as "the Lexicon": "You. You must take the Lexicon. Free me of my burden." When you respond, she merely continues: "The memories. I cannot stand them. You must take them away, return them to Avanchnzel. You must take the Lexicon from me. Please... take it now." She will not provide any explanations and will continue rambling until you accept. She then hands you a strange, ornately-decorated cube, and will walk away with the words: "You must bring it to Avanchnzel, in the west. Return it to them. It must go back." Drennen: "I don't like this place. It feels like we're being... watched." Breya: "It's a simple job, Drennen. We get in, we steal the Lexicon, we leave. Don't get jumpy." Fathoms: "If you two cannot handle this, we can find others to hire." Roots: "Enough. Their services will be more than adequate. Let us continue." The ghosts will then disappear without a trace. When you continue forward, you will notice a broken-down wall that leads into the actual ruin; clearly made by the ghostly adventurers. 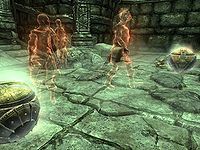 Inside the ruin, dwarven spiders immediately attack, so dispose of them and proceed through the empty halls until you reach a door. Drennen: "This place is unbelievable." Roots: "Indeed. Avanchnzel is as much a library as it is a city. Built to hold the vast memories of the Dwemer." "Why are all these metal... things... ignoring us?" Breya: "Why are all these metal... things... ignoring us?" Roots: "No one seems to know. Perhaps the return of the Dwemer. Perhaps the end of the world." Breya: "Best get rid of the ones we see. Just in case." When the ghosts and the machinery are gone, proceed down the corridor and enter the next zone, Avanchnzel Animoncultory. "I told you we should have hired a thief." "Maybe we should turn back. I don't want to sleep here." Breya: "I told you we should have hired a thief." Fathoms: "We are thieves, you fool. We're stealing the cube." Breya: "And yet none of us can pick a damned lock." Drennen: "This place is huge." Roots: "It is large, indeed. I did not anticipate Avanchnzel's size or the time needed to uncover the entrance. A few hours sleep and we should be ready to continue through." Drennen: "Maybe we should turn back. I don't want to sleep here." 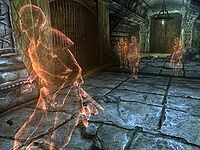 Roots: "Drennen, you do understand that the Lexicon at the bottom of this place holds the accumulated memories of centuries of Dwemer." Breya: "Not to mention our pay." Fathoms: "So we're not turning back, you fool." Breya: "Besides, you're not scared of a few sleeping metal men. Are you, Drennen?" Breya: "I thought you said these things were "sleeping"?" Roots: "You said they were sleeping. I said they were waiting. It seems a few of them were "waiting" for someone to try and take the Lexicon." Head down the southern corridor and open the door. A gigantic factory will appear before you, filled to the brink with dwarven spiders, as well as several dwarven centurions and spheres lying on tables, ready to attack if needed. With the exception of the spiders, none of them will attack, so locate the northern staircase and head down the slope to find the first evidence of what happened to the adventurers. "Soon the Lexicon's knowledge will be mine." Fathoms: "Let the field mouse run. Your pay will be double." Breya: "My pay will be nothing if we die in here!" Roots: "Calm yourself, Breya. We are closing in on the Lexicon. I can feel it calling. We'll continue without Drennen." Roots: "We are close now. Can you hear the Lexicon calling out?" Fathoms: "So we grab it and we get out, right?" Fathoms: "Ours. Soon the Lexicon's knowledge will be ours." "I can hear the Lexicon. Come on. Quickly!" Roots: "We're almost there. I can hear the Lexicon. Come on. Quickly!" Breya: "Something doesn't feel right." The three will then approach the door and Breya will shout, "Wait!" and Roots will cry out, "Aaaaaaaaaaa...." Behind the door, a set of pressure plates will transform the entire room into a deathtrap of nearly unavoidable spinning blades. At the bottom of the slope you will find Watches-The-Roots dead, obviously killed by the blades. You can turn off the trap with the handle near his body, then open the nearby door for the final showdown. 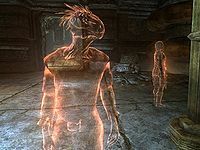 In the last chamber, Breya's body can be found dead near the pedestal, killed by the dwarven centurion lying next to her. Unfortunately, there is one more centurion in the room and it will get up as you approach the pedestal. After the battle, locate the Lexicon Receptacle in the middle of the room and place the Lexicon on it. 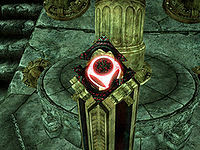 Once it is in place, behold the sight of power and memories as it opens. 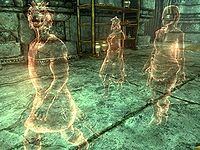 Your reward for following in the footsteps of some unfortunate adventurers is the passive effect Ancient Knowledge. 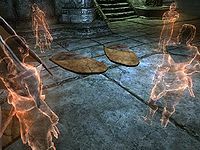 To leave the ruin, open the western door and take the elevator up to the first zone, Avanchnzel, and fight a few enemies. 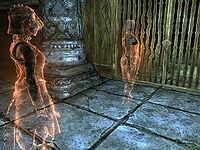 Locate the door with the wooden bar to the north and escape out unto the Avanchnzel Balcony, an exterior area that provides a breathtaking view over Skyrim. To the right is a locked Apprentice level chest containing minor loot. You can pickpocket the Lexicon from From-Deepest-Fathoms. The quest proceeds normally except From-Deepest-Fathoms will not ask you to return it. The quest will activate as soon as it is in your possession even if you have not spoken with her. If you return to From-Deepest-Fathoms in Riften, you will discover that she is now sane and has no more "memories". She will not even mention the Lexicon when you talk to her. 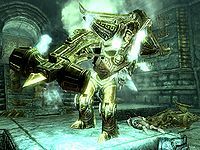 A scene near the giant dwemer factory is missing, since the trigger for it is located outside of the map: ? Breya: "The Lexicon had better be worth all this trouble." Roots: "I assure you, it is. The knowledge contained in the Lexicon created everything you see around you." Roots: "Properly controlled, it has knowledge enough to turn paupers into kings." Breya: "You sure that's power we're meant to have?" Fathoms: "I have the Lexicon! Where's the podium?" Breya: "I can't hold these things! We need to leave!" Fathoms: "I did not come all the way here just to walk out empty-handed." Breya: "The way out is right there! Run, damn it!" From-Deepest-Fathoms will not give you the Lexicon, preventing you from completing the quest. ? Type SetStage MS04 900 to end the quest instead. 900 I've returned the Lexicon given to me by From-Deepest Fathoms to Avanchnzel. The following empty quest stages were omitted from the table: 0, 140, 150, 160, 190, 200, 210, 240, 250, 260, 290, 300, 310, 340, 350, 360, 390, 400, 410, 440, 450, 460, 490, 500, 510, 540, 550, 560, 590, 600, 610, 640, 650, 660, 690, 700, 710, 740, 750, 760, 800, 850. On the PC, it is possible to use the console to advance through the quest by entering setstage MS04 stage, where stage is the number of the stage you wish to complete. It is not possible to un-complete (i.e. go back) quest stages, but it is possible to clear all stages of the quest using resetquest MS04. Esta página foi modificada pela última vez à(s) 06h53min de 3 de maio de 2015.